Heat oven to 375°F. Spray 13x9-inch pan with cooking spray. In small saucepan or 2-cup microwavable measuring cup, heat butter and milk until steaming hot (about 1 minute on High in microwave). Meanwhile, in large bowl, beat eggs with electric mixer on high speed until light. Gradually beat in 3/4 cup granulated sugar; beat 2 minutes longer. Add flour, baking powder, salt, vanilla and hot milk mixture; beat on low speed until smooth. Pour batter into pan. Bake 14 to 16 minutes or until cake springs back when touched lightly in center. In 1-cup measuring cup, mix coffee and 1 tablespoon granulated sugar. Drizzle over warm cake. Cool completely, about 30 minutes. In large bowl, beat cream cheese and mascarpone cheese with electric mixer on medium speed until smooth and creamy. Beat in powdered sugar and wine. In large bowl, beat whipping cream with electric mixer until stiff peaks form. Fold into cream cheese mixture until combined. Spread evenly on cake. Sprinkle grated chocolate over top of cake. Cover; refrigerate at least 4 hours or overnight. To serve, cut into squares. Store in refrigerator. For a shortcut version, skip baking the cake and use ladyfingers instead. Purchase two 3-ounce packages and layer ladyfingers from one package in bottom of baking pan. 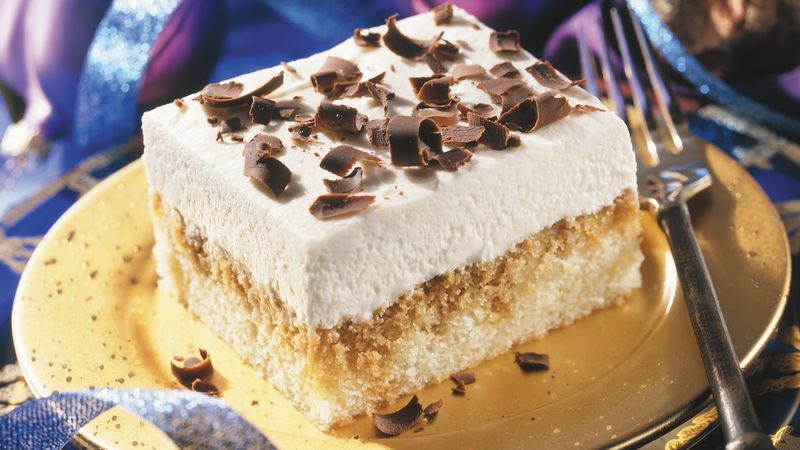 Drizzle ladyfingers with half of coffee mixture; spread with half of topping. Cover topping with remaining ladyfingers. Drizzle ladyfingers with remaining coffee mixture; spread with remaining topping. Continue as directed.